A lawyer’s offer to barter for a headshot. 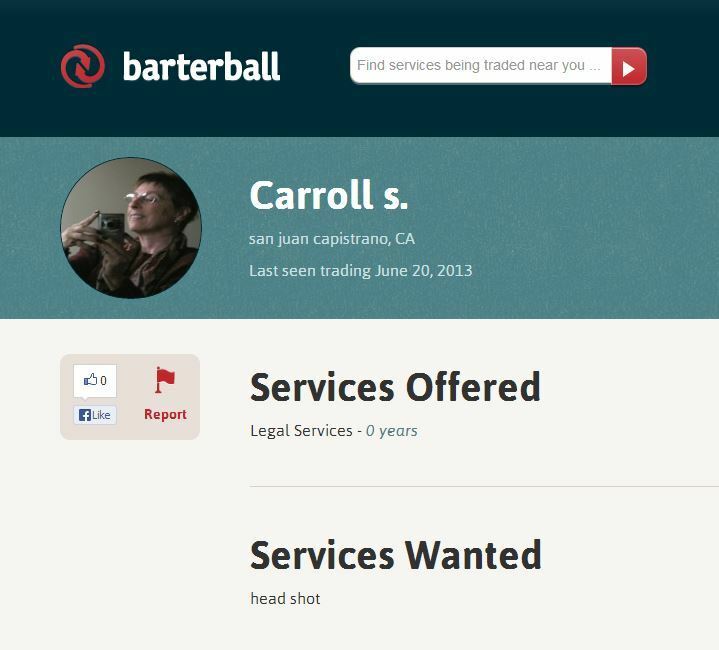 A website launched this week, Barterball, enables lawyers and others to barter their services in exchange for other services they may need, such as accounting or website design. The site is open to anyone, not just lawyers, but it was founded by lawyer and longtime legal website entrepreneur Steve Fuchs, who cofounded Divorcenet.com in 1994 and ran it until 2010, when it was sold to Nolo.com. In fact, as an example of how Barterball might work, Fuchs describes a DUI defense attorney whose house needs painting. A painter who lives nearby was just arrested for DUI. Offline, these two might never meet, Fuchs says, but Barterball’s technology could bring them together. The way it works is straightforward. You set up a profile describing the services you have to trade and the services you need. You then search for members in your vicinity who offer the services you need. You reach out to the member with an offer to trade and, if the member accepts, you receive notice of the acceptance and then communicate directly to finalize details. Once a barter is completed, each member is encouraged to leave feedback evaluating the other. For now, Barterball is free to use. The site might eventually charge a modest monthly subscription or add advertising, Fuchs told me, but no firm plans are in place.